It’s no coincidence that the first month of our calendar is named January. The Romans named the month after Janus, their god of transitions who is normally depicted with two faces, one looking forward and one looking backward. And indeed, January is a time for reflection and planning; the hustle and bustle of the festivals of Christmas and Yule are fading into the past their only remembrance being the graveyards of bare trees that line the neighborhood curbs for recycling. It’s a time to look back over the past year and see how your endeavors stacked up against your expectations in the things that you tried to accomplish in your life, so why not your beer blog? Taking a quick look back over the past year’s craft beer ups and downs is a nice way to ground yourself as you prepare to move forward. But don’t over analyze, or beat yourself up if a certain goal wasn’t met. After all, we’re talking beer blogging and craft beer here, not life changing declarations. No, just take a minute run a quick glance over you blog. Of the goals you didn’t meet, why didn’t you? Chances are there will be various reasons. Again don’t sweat it, maybe life brought forth more important things for you to focus on, or perhaps as time went on you realized that a particular goal wasn’t really that important to you after all. Or decided to start a new monthly series of articles based on another subject, that will tie very loosely to blogging and beer. Maybe just because you want to write something different, and you thought it would be a cool idea. Nothing is too small. The January full moon is known in older Wiccan traditions as the Cold Moon. It’s one of several moons whose name really doesn’t need much explanation especially, if like me, you’re a recent survivor of the Polar Vortex. Other names like Ice (Neo-Pagan), Snow (Odinist) and Frost (Shamanic) also speak to this time of year. While the Celtic name, Quiet, probably speaks more to the inherent silence of nature at this time. I happen to enjoy sipping on a few beers during the full moon, especially out on the deck or next to a fire. Unfortunately, January tends to be one of the more cloudy months around these parts, so there probably won’t be much in the way of moon light tonight. And opposition (the precise astronomical time the full moon occurs) isn’t until 11:52pm tonight which, school night considering, is a tad past this old man’s bed time. Still, I think a few beers will be in order. To counteract the Cold/Ice/Snow, I’m thinking a nice barleywine-style ale. Something along the lines of Victory’s Old Horizontal, Weyerbacher’s Blithering Idiot or Flying Dog’s Horn Dog. Or perhaps since Native Americans referred to this moon as the Wolf Moon, some of Lancaster Brewing’s Winter Warmer, an Old Ale-style beer, is appropriate. Proceeds from this beer help support the Wolf Sanctuary of PA. However you decide to go, you really can’t go wrong. Coming up : Long over due run downs on Kennett’s Brewfest and The Delaware Wine and Beer Festival; It’s not your Dad’s State Line Liquors anymore; I finally get my hands on The Bruery’s Six Geese a Laying; and I’ll be rummaging around my basement for another beer relic. Cheers, and happy 2014! Let’s make it a good one! 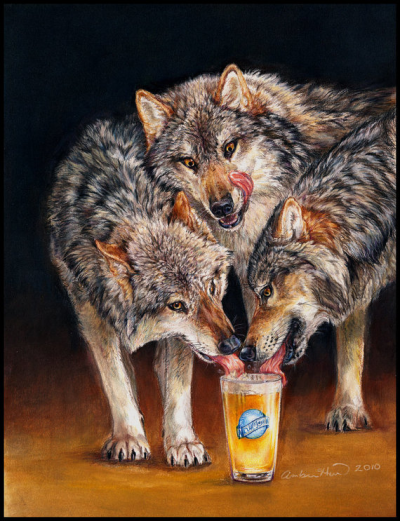 THE FINAL SIP: This post’s featured image is a print entitled “Three Wolf Moon Beer Wolves” by artist Amber Hill. Amber describes the scene as, “A spoof on the now infamous T shirt as well as a rib at ‘Twilight'”. For this and more of Amber’s work check out Ethereal Studios. Same to you and the gang! Next Next post: The Local Tap – Kennett Square Brewfest 2013, Hey Aren’t You Supposed to Be Over There?